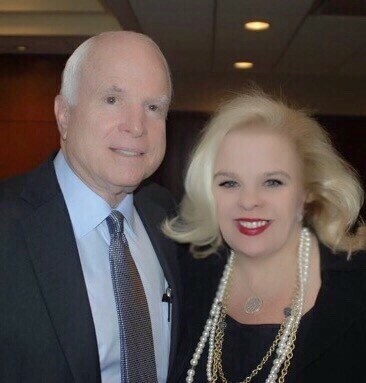 Michele Combs with Sen. John McCain. In the neighborhood of Charleston, South Carolina where she lives, Michele Combs estimates that out of 300 homes, as many as 50 may have solar panels installed on the roof. Michele is also in the market for solar on her place. And like many solar buyers these days, she’s done her homework about the benefits. And keep in mind, Michele doesn’t live in a deep blue state that’s encouraged solar for years like California or Massachusetts. She lives in South Carolina, which has taken a less aggressive approach to clean energy — until recently. People who don’t think of South Carolina as a big state for solar power will be surprised to learn that this reddest of red states has become the hottest market for solar in the Southeast and one of the fastest growing solar states in the whole country. Unlike many states, South Carolina offers a big tax credit to encourage solar. Homeowners who install solar panels can reduce their taxes by 25% of the costs of their solar system, up to $3,500 per year for up to ten years. In addition, in its utility service area, Duke Energy Progress offers its own generous incentive for solar on top of that. As a result, in 2016, South Carolina jumped into the top solar states, ranked ninth nationwide for installed solar capacity. That’s a yuuuge leap from its ranking at #36 in 2015, writes the Palmetto Business Daily. Much of the credit for the Palmetto State’s leadership in solar goes to the state’s conservative leaders, among them Michele, who successfully argued that power is good for the free market. As founder and chairman of Young Conservatives for Energy Reform, Michele has helped pass laws to support net metering and other policies to support solar power in South Carolina and other states. And in her energy advocacy, Michele has found conservatives to be eager to help. Like the story of solar in South Carolina, Michele’s own story is also full of surprises. For example, she’s a veteran of the Young Republicans with an impeccable conservative pedigree (her mom is Christian Coalition President and CEO Roberta Combs). Yet, she also cares about climate change. And she thinks that other young conservatives feel the same way. Michele thinks that young conservatives have no problem accepting climate science. But she thinks that the issue hasn’t been presented in a way that welcomes conservatives to join in solutions. But conservatives can support solar power even if they don’t believe that climate change is a real threat or that it’s caused by human activities. And that’s the real point — not insisting on climate orthodoxy, but getting more people into clean energy, whatever their reason. Michele is trying to fix that by exposing young conservatives to messengers who will be more appealing to them. For a couple years now, Michele’s group has held a national summit each year in Washington, DC that brings together energy-aware young conservatives from around the country to meet with Republican legislators and business leaders. Last September’s 2016 Conservative Clean Energy Summit featured an all-star lineup of Republican legislators — Senator Chuck Grassley (R-IA), Senator Lindsey Graham (R-SC), Congressman Mark Sanford (R-SC), Congressman Tom Read (NY), Congressman Chris Gibson (R-NY) and Senator Cory Gardner (CO) — along with retired Marine General Richard Zilmer, an advocate of American energy independence, and representatives of the wind and solar industries. Anyone who cares about solar power should be encouraged that so many important conservative leaders are serious about supporting clean energy. Clearly, renewables are not just an issue for environmentalists and liberal Democrats anymore. And that’s exactly what’s needed for solar to start to reach its potential in America — bipartisan support for clean energy from established conservative leaders like Senator Lindsey Graham and from emerging conservative leaders like Michele. One of Michele’s favorite parts of the events so far has been hearing from her fellow young conservatives in different states. Michele thinks that ordinary citizens, whether they own solar panels yet or not, are key to helping solar spread across the country by serving as active advocates for clean energy in their communities and even at the national level. What does Michele think that citizens can do to support solar? Let your legislators know that you want clean energy legislation and that you want to continue tax credits like South Carolina’s or net metering as in many states. If fossil fuel companies that make millions of dollars in profits still get tax credits and other subsidies, then clean energy deserves public support as well. Lead by example on energy. If you don’t have solar already, seriously think about having it installed. In the meantime, consider energy-efficiency upgrades like new windows and LED light bulbs. Consider joining a group. There are a lot of clean energy groups out there like Michele’s. Connecting with an established group will help you keep up with what’s going in Washington and in your state.